MAKATI CITY — Philippine (PH) exports weathered a slowdown in external demand in June to register a strong first semester performance, the country’s trade chief said. “We always ensure that exports are both resilient and diversified in terms of products and markets,” Department of Trade and Industry (DTI) Secretary Ramon Lopez said. Said expansion is seen almost among all the country’s major export markets, with the People’s Republic of China (including Hongkong SAR) as the country’s top export destination, followed by Japan and the United States (US), according to him. Preliminary data from the Philippine Statistics Authority showed that the 15% growth of Non-electronics exports outpaced the 12.05% rise in Electronics, accounting for almost equally at 50.1% and 49.9%, respectively, of total merchandise exports. “The stronger performance of Non-Electronics products vis-à-vis Electronics reflects DTI’s efforts to diversify merchandise exports and improve market mix,” Sec. Lopez added. For the first semester of 2017, receipts of the following non-electronics increased: Mineral products (81%), Chemicals (11%), Coconut (78%), Footwear (70%), Furniture & Fixtures (43%), Processed Food & Beverages (29%), Machinery & Transport Equipment (24%), Garments (23%), Travel Goods and Handbags (8%), and Iron and Steel (4%). DTI Undersecretary and Board of Investments (BOI) Managing Head Ceferino Rodolfo confirmed that non-electronics have been accounting for a bigger share of total exports from an average of 40% in 2006-2010 to a 54% average in 2011-2016. “DTI has been partnering with relevant agencies, industry associations as well as specific exporters in improving PH leadership in certain sectors such as in activated carbon, oleochemicals, bananas, pineapples, tuna, and carrageenan/seaweeds and other algae, where assistance to improve quality and quantity of supply is top-most of the agenda,” said Usec. Rodolfo. DTI also creates more conducive exporting environment for sectors that have crossed or is close to crossing the USD 1 billion value of exports such as travel goods, handbags, footwear and apparel, aircraft parts, coconut, transport services, construction materials such as builders’ joinery and carpentry of wood including wood panels. In terms of PH markets, PH’s expansion in exports can be seen in almost all of PH’s export partners, with PROC (including Hongkong SAR) being top export destination, followed by Japan, the United States (US), Singapore, Korea, Thailand, Germany, The Netherlands and Taiwan. PH shipments to almost all these country destinations increased. According to Usec. Rodolfo, it is worth noting that currently, ASEAN and East Asian neighbors accounted for about 63% of total PH exports, while the US and the European Union (EU) accounted almost equally for 14.7% and 14.9%, respectively, as a result of our pursuit of active trade relations due to opportunities resulting from ASEAN’s free trade agreements with China, Korea, Australia and India. “We have been seeing in recent years the gradual shift in market distribution leading to a balance in market diversity,” said Sec. Lopez. While the US continues to be one of PH’s top export destinations, its share to PH total exports has declined from 8% in 2006-2010 to 6% in 2011-2016. Stronger relations with PH neighbors made ASEAN a consistent market for bulk of our products. China, in recent years, has also emerged as a consistent top market for PH export products, validating PH’s pursuit of an independent foreign policy as the country opens up to new trade partners and finds new markets and new value chain linkages for trade and investments. China accounted for the fastest growth rate at 34%. “Recent data also showed exports to EU posted strong growth at about 36% due to greater number of utilization of Generalized Scheme of Preferences Plus (GSP+) trade privileges where over 6,000 product lines have 0% tariff duty,” said Sec. Lopez. The trade chief added that the immense goodwill shown by President Rodrigo Duterte to other nations has resulted to re-strengthened ties not only with China but also with the Middle East. The benefits of special trade arrangements with EU also led to faster export growth in many countries. Semiconductors, which accounted for 72% share of total electronics exports and 36% share of total PH exports, expanded by 12%, driving the growth in electronics. The share of electronics sector to total merchandise exports has been reduced from an average high of 60% in 2006-2010 to 46% average for 2011-2016. The strong global growth in 2017, particularly the surge of global electronics demand, augurs well with the implementation of the regional industrialization plan of the CALABARZON area, which will diversify electronics exports especially in the production of auto electronics parts and components and business expansion towards merging manufacturing with IT through engineering services outsourcing and other areas. Electronics exports are concentrated in the CALABARZON area, specifically in Laguna, where sales reached almost USD 7 billion for a remarkable growth rate of 146%, and in Cavite, with exports valued at USD 3 billion for a 72% growth. Together, Laguna and Cavite accounted for almost 60% of total electronics exports. “We are off to a good first semester. The second semester should see us further raising our game to boost PH exports for a bigger share of the global market,” Sec. Lopez concluded. CAMP LUKBAN, Catbalogan City – A 20-minute fire fight ensued between the Scout Platoon from 78th Infantry (Warrior) Battalion and the communist terrorists at Barangay Roxas, Burauen, Leyte on August 15, 2017 at 10:00 o’ clock in the morning. This resulted to the troops’ recovery of one (1) back pack, one (1) sack of rice, and subversive documents from the communist terrorists. No casualty was reported on the government side and undetermined number of casualties on the enemy side. The successful seizure of the enemy encampment is the result of the mutual cooperation of the villagers in the said barangay about the presence of the NPA rebels that continue to extort, recruit and harm the less fortunate. Maj. Gen. Raul M Farnacio, Commander, 8ID commended the people of Burauen for their untiring cooperation with government forces against the presence of the NPA terrorists. Rest assured that the 8ID remains steadfast in its unending commitment to serve the people and to become one of the catalysts for peace and development in Eastern Visayas. QUEZON CITY – In time for the budget hearings of the Department of National Defense at the Committee on Appropriations at the House of Representatives, Karapatan joined the Save Our Schools (SOS) network and various people’s organizations in a protest action against the proposed 2018 budget, particularly items in furtherance of fascist and anti-people policies of the Duterte administration. Marked increase is noted in the proposed budget allocation for the Office of the Presidential Adviser on the Peace Process, which pursues the disarmament, demobilization and reintegration (DDR) approach of the United Nations, as adopted by the Duterte administration on its so-called peace processes. Such approach, Karapatan said, is criticized by progressive human rights and peace advocates worldwide as a palliative and ineffective way to address the root causes of armed conflicts. “The DDR strategy plays right into the whole counter-insurgency objectives of the Duterte regime, using combat operations and deceptive schemes to pacify the people and revolutionary movements, instead of genuinely addressing poverty, inequality and transgressions on national sovereignty,” Palabay said. Proposed 2018 intelligence and confidential funds also increased from 200% to 400%, as compared to the 2016 actual budget. Moreover, out of the proposed 2018 proposed budget of the PNP, at least PhP94 billion is allocated for conduct of operations against so-called dissidents, subversives, lawless elements, and organised crime syndicates. “These funds will be used by AFP Chief Eduardo Año and PNP Director General Ronald dela Rosa to operate on perceived and make-believe enemies of the Duterte regime – from small-time drug users/peddlers tagged by Duterte as anathema to public security, to imaginary terrorists and revolutionary groups tagged as enemies of the State. The State’s limited and deficient understanding of the roots of the social ills prevalent in Philippine society has allowed for the funding and continuation of deceptive and dubious policies meant to mask intelligence and other military and police operations. The State’s security machinery, led by Año, Esperon, Lorenzana and Dela Rosa, are clearly uninterested in solving the roots of the conflict. Instead, they seem perfectly content in their ignorance and mindless targeting of civilians and progressive organizations. As in the Aquino III administration, these funds will not only be used to justify the killing of civilians, but these will be used to further the money-making schemes of the soldiers and police who are just out for the bounties,” Palabay added. Karapatan said that “instead of funding such bloody campaigns that result in the increased violation of people’s rights, the Duterte regime should reallocate public funds to key economic and social reforms that will genuinely address the root causes of societal problems. QUEZON CITY – Latest data on the net worth of the members of the House of Representatives (HOR) show that the party-list system is rich in contradiction and poor in execution. Given that three party-list representatives are among the 10 richest legislators, it is clear traditional politicians and political dynasties have benefited most from a Supreme Court decision four years ago. It may be recalled that on April 5, 2013, the SC, voting 10-2-1, said that "National parties or organizations and regional parties or organizations do not need to organize along sectoral lines and do not need to represent 'any marginalized and underrepresented' sector." Even if Kontra Daya also observes that nine out of the 10 poorest legislators are also party-list representatives, it is imperative for the SC to review its 2013 decision and reaffirm what then Justice Artemio Panganiban wrote as regards Bagong Bayani v. Comelec in 2001. The ruling elite, especially the political dynasties, should not appropriate the party-list system to add more seats among themselves, paying lip service to representing the marginalized and underrepresented. The party-list system belongs not to them but to those they claim to represent but continue to exploit. TAGUIG – Global Online Car Platform Carmudi has officially launched its CSR initiative, which aims to uplift and educate young drivers on road safety. Held at Cebu Doctors' University in Mandaue, Cebu, the Carmudi Academy for Road Safety (CARS) program is designed to create awareness and help students (particularly in Universities and Colleges) elevate their basic understanding of road safety. Lim shared insights about the stunning figures of road accidents in the country. He explained that there's a huge number of the motoring public (composed of drivers, pedestrians and commuters) lack the basic understanding on road signs, markings, traffic rules and regulations, has seemingly insufficient skills on defensive driving road scenarios, as well as unruly behavior while on the road. Further, the Automobile Association Philippines (AAP) – a constant partner of Carmudi Philippines in their road safety efforts – took part in the inauguration of the CARS program. 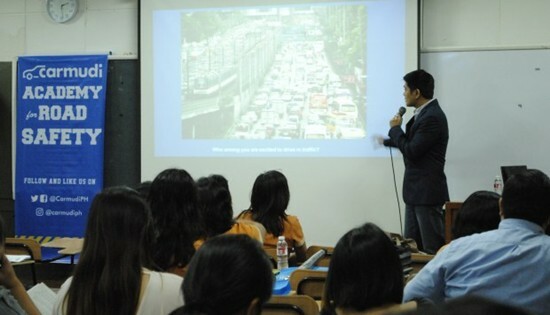 Through AAP Advocacies Manager Cynthia Reyes, the national auto club provided the participants an overview of the Republic Act 4136 – also known as the Land Transportation and Traffic Code – and showed scenarios which yield to road crashes. Carmudi forged partnership with AAP that also led to assisting the club in the reproduction of copies of the RA 4136, which was also given to the participants. MANILA – The ongoing conflict in Marawi City in Lanao del Sur province has displaced thousands of people, with more than 77,000 fleeing to hard-to-reach areas along the eastern shore of Lake Lanao. The International Committee of the Red Cross (ICRC), in partnership with the Philippine Red Cross, has just completed from August 9-10 an aid distribution among 7,000 displaced people in Tamparan municipality. Though aid has started to arrive, much more is required to meet the needs of people who have fled to this area when the fighting erupted on 23 May. Unlike those who fled towards the north or west of Marawi, displaced families along the eastern shore of Lake Lanao have not received regular help owing to access, logistical and security issues. Complementing the aid delivered by the authorities, the ICRC focused its distribution on evacuees staying with their relatives, who have been underserved till now. The organization distributed a half-month food ration and household essentials, i.e. 25 kg of rice, 12 cans of sardines, 1 litre of cooking oil, 1 litre of soy sauce, 1 kg of sugar, 500 g of salt, two jerry cans to store water, one blanket and one mosquito net per family. 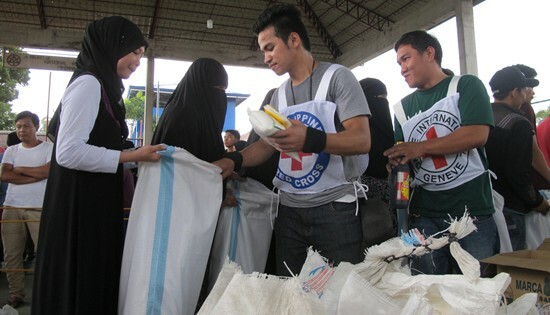 Among the thousands who have received ICRC help is Asliya Casanali, a young mother of three from Marawi City who now sells spices in Tamparan market to try to make ends meet. Her husband was a tricycle driver in the city until the fighting broke out. “Minsan kapag walang ulam, kanin na lang. Hindi namin naranasan yun dati (When there is nothing else available, we make do with rice. We had never faced such a situation before),” she said. In Tamparan, the ICRC has also been providing the public hospital with essential medical supplies to handle the sudden influx of people in need of medical attention. Its engineers have also set up a mobile water-purification system to improve the supply of drinking water in the hospital compound. In the coming weeks, the ICRC will continue its efforts to help the thousands of displaced people along the eastern shore of Lake Lanao. MAKATI CITY – As part of the agency’s thrust to increase awareness on the positive gains of entrepreneurship, the Department of Trade and Industry (DTI) and Technical Education and Skills Development Authority (TESDA) link up to provide TESDA graduates with access to trainings on entrepreneurship to help generate to equip them with the necessary skills on entrepreneurship and employment. According to DTI Sec. Ramon Lopez, acquired business skills by TESDA trainees from the Skills Training for Employment/Entrepreneurship Program (STEEP) can be used in effectively running their businesses in the future. “This partnership not only complements our objective to equip our people with the right mindset and basic skills, it also contributes to our national goal to realize inclusive growth towards shared prosperity, powered by smarter Filipino entrepreneurs,” Sec. Lopez said. STEEP aims provide interventions through skills development by providing access to training on entrepreneurship to graduates of TESDA program for self or wage employment to uplift their economic status. “Through this partnership, we are glad to help TESDA graduates acquire more skills and development which can give them more opportunities to improve their lives by engaging in vibrant entrepreneurial activities,” said DTI Regional Operations Group Undersecretary Zenaida Maglaya. Under the agreement, TESDA will provide its list of graduates to DTI from the Special Training for Employment Program (STEP) and other similar scholarship program, assist in the conduct of the entrepreneurship training, and monitor and evaluate the implementation of the project. Upon assessment and selection of TESDA’s certified STEP graduates, DTI, in turn, will provide entrepreneurship training, assist in availment of the microfinancing facilities, provide them access to start-up capital for micro enterprises, and even facilitate business registration of those who wish to engage in business/sole proprietorship. The STEEP agreement with TESDA is one of the Department’s initiatives to sustainably generate employment and further promote entrepreneurship in the country as DTI pushes for its “Trabaho at Negosyo” agenda.